His frequent travels to countries such as Kenya, Tanzania, Rwanda, India, Nepal, Thailand, Australia, Indonesia, Mexico and the Amazon have given Duane the opportunity to study wildlife in their native surroundings. His bronze, gold and silver sculptures capture the unique traits, power, grace and beauty of the many animals he has brought to life through his work. 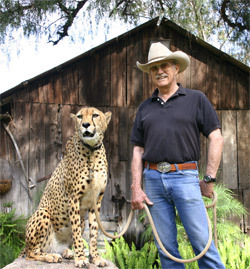 Duane’s studio is located at his ranch in Lakeside, California, Pillsbury Land & Livestock Co., where his days are filled with art, conservation efforts, and caring for over thirty wild animals, fifty horses, and personal pets. Duane also manages a community riding club, shows horses and livestock and serves on conservation oriented boards.